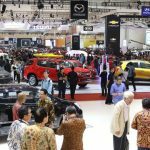 JAKARTA— Several brands of passenger vehicles and light commercial vehicles have released sales’ figures and targets this year. Each brand seems optimistic that it can increase or maintain market share. This year, the Association of Indonesia Automotive Industries (GAIKINDO) projects the market to grow moderately. Vehicle sales are predicted to be not much different from that in 2017 (1.15 million units). In 2018, competition between the top five brands gave dynamics and flairs to the automotive industry. The exchange of the best-selling brand ranks is intense. Business Indonesiasummarising the sales targets made of those five large brands as follows. Toyota has long been the leader of Indonesia’s car market. This year, PT Toyota Astra-Motor (TAM) as the holder of the Toyota brand targets to keep up with a minimum market share at the level of 31 percent of total national sales. Toyota shows a fairly aggressive move at the beginning of the year by introducing two new models, the All New Camry sedan and the New Avanza that are expected to regain Toyota’s domestic sales. The low small passenger vehicle (LMPV) has been a contributor to sales volume because it always occupies the top position as the best-selling model. Despite a slight decline in 2018, Avanza is still the best-selling model. In GAIKINDO’s record, Toyota’s share in the past two years has not decreased. At the end of 2016, Toyota was still able to deliver 381,570 units, 36.1 percent of the total 2016 sales of 1.05 million units. In 2018, Toyota’s share was at the level of 30.6 percent (352.161 units). In 2018 Toyota share shrank by almost four percent compared to 2017, even close to that in 2016. In terms of product lines, Toyota is one of the complete manufacturers ranging from sedans, city cars, MPV, SUV, pickup. Toyota is quite dominant in the MPV segment with Avanza, Innova and Voxy, and Alphard. Daihatsu: One Strip behind Toyota? In the past 10 years, Daihatsu has always been able to maintain the second position as the best-selling brand in the country. When Toyota’s market share was eroded, Daihatsu, on the other hand, was still able to grow. GAIKINDO noted, in 2018 Daihatsu gained 17.6 percent, up slightly from 17.3 percent in 2017. Sales of Daihatsu seemed stable with the largest sales contribution coming from the low cost green car (LCGC) model Daihatsu Sigra. Other contributors to Daihatsu’s sales volume come from Gran Max and Xenia. Together with its cousin Toyota’s Avanza, Daihatsu also introduced the New Xenia in early January 2019. Daihatsu certainly does not want to be displaced by other brands. Competition is getting tighter because other brands are improving both in terms of products and after-sales services. Honda: Relying on Brio & Mobilio? Honda became one of the brands whose market share was eroded in 2018. GAIKINDO recorded that by the end of last year, Honda saw a share of 14.1 percent thanks to sales of 162,170 units. The total shipment of Honda vehicles to dealers (wholesales) fell considerably in 2017, Honda won a 17.3 percent share of the national automotive market share. Not wanting to slump deeper, Honda refreshed its flagship Mobilio LMPV model. Honda has also refreshed Brio which has been one of the pillars of Honda’s sales. Brio and Brio Satya became one of the best-selling models in 2018 (59,630 units). The sales of Brio and Brio Satya put this model as the fifth best-selling model in 2018. 2018 looks to be the year of Mitsubishi Motors that is almost able to double the market share. GAIKINDO noted, Mitsusbishi Motors closed 2018 with a 12.4 percent share of the market. Whereas, in 2017, Mitsubishi Motors’ share was only 7.4 percent. The presence of Xpander model brings big fortune to Mitsubishi sales in Indonesia. This year, Mitsubishi still relies on Xpander as a contributor to its sales volume. Mitusbishi’s challenge to maintain market share this year may be quite tough considering Xpander’s flagship product should confront face to ace with the arrival of new cousin, the New Nissan Livina. Using the same platform as Xpander, the New Livina has the potential to undermine Xpander’s sales. Naoya Nakamura (President Director of PT Mitsubishi Motors Krama Yudha Indonesian Sales, MMKSI) said this year’s sales are targeted to reach 150 thousand units, up slightly from 146,805 units (retail sales). Mitsubishi car sales are projected to grow by around two percent in 2019. “We are not pessimistic, nor too optimistic. The car market remains stable,” he said. PT Suzuki Indomobil Sales (SIS) targets to reach 11.1 percent market share in 2019. That number is higher than the 2018 sales of 10.25 percent for wholesales. “We target a market share calculation, from 10.25 percent to 11.1 percent, “said Setiawan Surya (4W Deputy Managing Director of SIS).